Russian and Ukrainian leaders have concluded their first official face-to-face meeting in Minsk during which they discussed Ukraine's Association Agreement with EU and the crisis and humanitarian disaster in the east of the country. However, Russia did not and had never set forth conditions for settling Ukraine’s internal conflict, Putin added, so a ceasefire agreement was not discussed during the talks in the absence of peace suggestions from Ukrainian leadership. “We, Russia, cannot talk about any ceasefire conditions whatsoever, or possible agreements between Kiev, Donetsk and Lugansk,” Putin stated. “We can only facilitate the creation of an environment of trust in the course of this possible and much needed, in my opinion, negotiation process. This is what we talked about,” Putin added. In the meantime a contact group on the implementation of Ukraine's Association Agreement with the EU must resume its work as soon as possible to formulate final conditions for the free trade zone, Putin said. “Not all of our arguments are accepted by our colleagues, but at least we were heard and we have agreed to intensify the exchange of views, and try to find some solutions,” Putin said, adding that in the absence of a final agreement Russia will have to “take measures” to protect its economy. 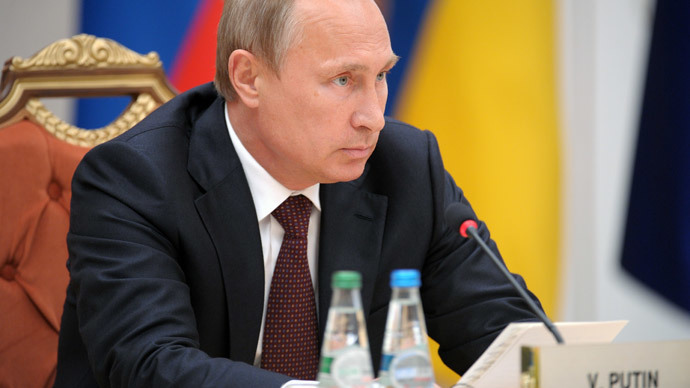 The sides have also agreed that a resumption of gas and energy talks is urgently needed, the Russian president said. President Poroshenko meanwhile quickly left the building after the talks, giving no comment to the press, and headed to the Ukrainian embassy in Minsk. There he has held a ‘wrap-up meeting’ with the head of European diplomacy, Catherine Ashton, the Presidential press service said. Ukraine has reached an agreement with Russia to start consultations between the border guards and the general staff of the two states in order to produce initial conditions for reaching a settlement in east Ukraine, Poroshenko told the press afterwards. 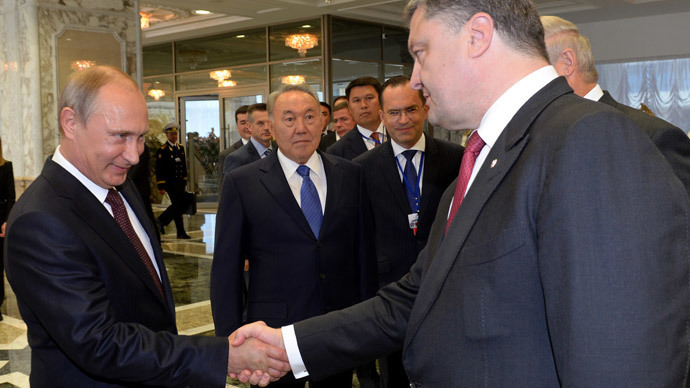 Poroshenko also said that a peace plan will be prepared soon for a speedy cessation of hostilities. "A roadmap will be prepared in order to achieve as soon as possible a ceasefire regime which absolutely must be bilateral in character," Poroshenko said in a statement. The talks between Putin and Poroshenko in Minsk marked the first time the two had a formal meeting after the Ukrainian leader secured his office in June. Both leaders had met briefly on the sidelines of the Normandy landing celebrations in June in the company of German Chancellor Angela Merkel and French President Francois Hollande. 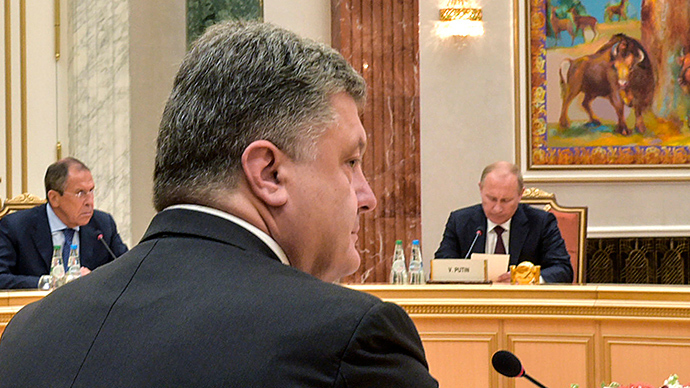 However both Poroshenko and Putin have engaged in telephone discussions in the past over the Ukrainian crisis. Presidents Vladimir Putin and Petro Poroshenko sat down for bilateral talks at around 6pm GMT, following hours of discussions between the Eurasian Customs Union, the EU and Ukraine in the light of the signing of the association agreement with the EU by Kiev. The multilateral talks in the Belarussian capital were cordial and positive, said EU foreign policy chief Catherine Ashton, in the meantime emphasizing the need for a ceasefire in Ukraine. “It was cordial but positive. There was a sense in which the onus was on everyone to see if they could do their best to try to resolve this,” Ashton told reporters. “We all wanted a breakthrough,” President of Belarus Alexander Lukashenko said in his closing remarks following the multilateral talks. 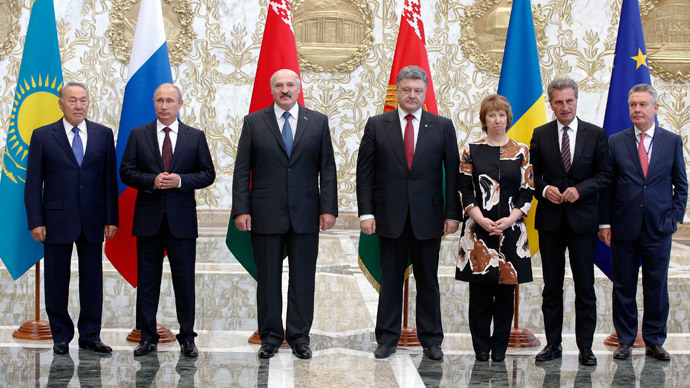 A new meeting on the settlement of the Ukrainian conflict may take place in Minsk on Wednesday, Lukashenko added. Ukraine has been engulfed in civil war since April, when Kiev’s military began its crackdown on the southeast of the country after the people in the Donetsk and Lugansk regions refused to recognize the new coup-imposed authorities. According to the United Nations’ latest estimates released, over 2,249 people have so far been killed and over 6,033 wounded in the fighting in eastern Ukraine. The number of internally displaced Ukrainians has reached 190,000, with another 207,000 finding refuge in Russia, the UN said.